Retro styles like the adidas AR trainer takes its inspiration from classic archive court styles and the legendary 80s tennis era. As new trainer silhouettes come and go, it’s still fair to say that the majority of the most respected trainer styles out there originate back in the 1980s and 1990s. Even the latest trainer releases usually have archive inspiration. Take the adidas AR trainer for example. An archive inspired 3 stripes silhouette which looks back to the nostalgic 80s tennis era when the likes of Boris Becker, Steffi Graf, Stefan Edberg and Ivan Lendl ruled the courts and the Grand Slam titles. The adidas AR trainer harks back to a golden era of tennis with adidas footwear designs from 1988 and original late 80s silhouettes which were designed for performance and multi surface use. Drawing inspiration from original adidas tennis silhouettes like the adidas ATP 3000 and the adidas Edberg, the retro court style features a mixture of leather and suede uppers, a lightweight EVA midsole, trefoil branding and 80s inspired performance tennis colourways. The AR perfectly captures the 80s era and all that tennis nostalgia with it. 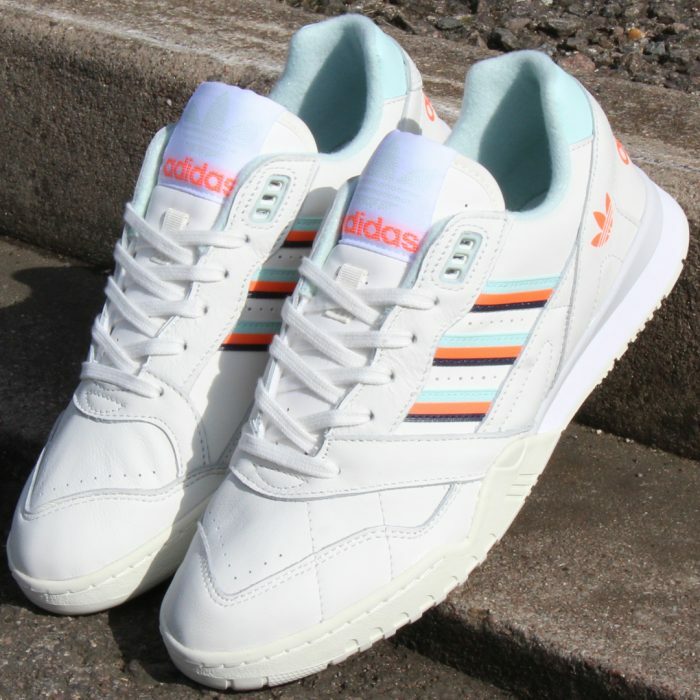 Above: The adidas AR trainer in white/ice mint now available at 80s Casual Classics. We’ve also just introduced the Reebok Rapide to 80s Casual Classics, an original mid 90s style fresh out of the running archives. First introduced in 1995, the Reebok Rapide was recently revived with a new found love for retro runners and original 90s trainer style. The Rapide moved away from the Union Jack branding we saw throughout the 80s with OG styles like the Classic, the Reebok Workout and the Club C 85 to name a few. The 90s marked a new generation for trainer technology and signalled a new wave of colourful retro runner styles for the ultimate in comfort and sporty looks. Highlights of the Rapide include 90s inspired bright colourways with suede and mesh uppers and an EVA midsole for superior lightweight cushioning underfoot. The Reebok Rapide is a perfect addition to any trainer lovers’ footwear collection and a retro reminder of that colourful 90s trainer style. 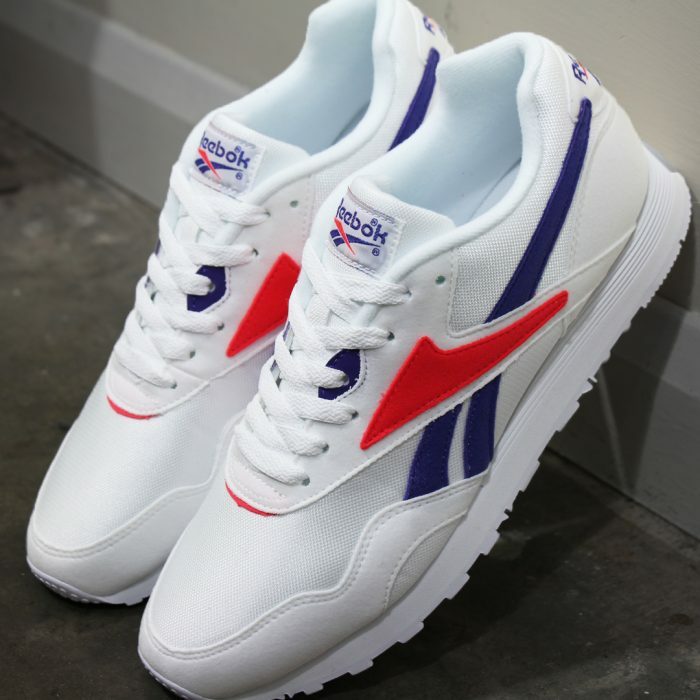 Above: The Reebok Rapide trainer in white/purple/blue now available at 80s Casual Classics. Finally, we’ve got more old skool 80s vibes with the original classic from the Bolton born sportswear brand, the Reebok Classic. Born in 1983 throughout the 80s fitness boom, the Classic became a popular workout shoe with its all-purpose leather gym design and all day casual style. 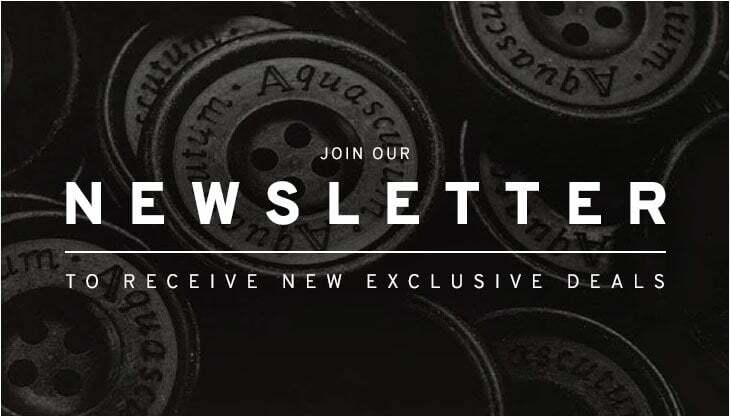 Over the last 35 years the Classic has become something of an icon in the trainer world and all time favourite style across the UK from London to Liverpool. Now re-introduced in retro-inspired colourways the Reebok Classic is revived with all its 80s runner charm. Features include a combination of soft leather, suede and mesh uppers with the iconic Reebok Vector and Union Jack branding to the sides alongside a lightweight EVA midsole for all day comfort. 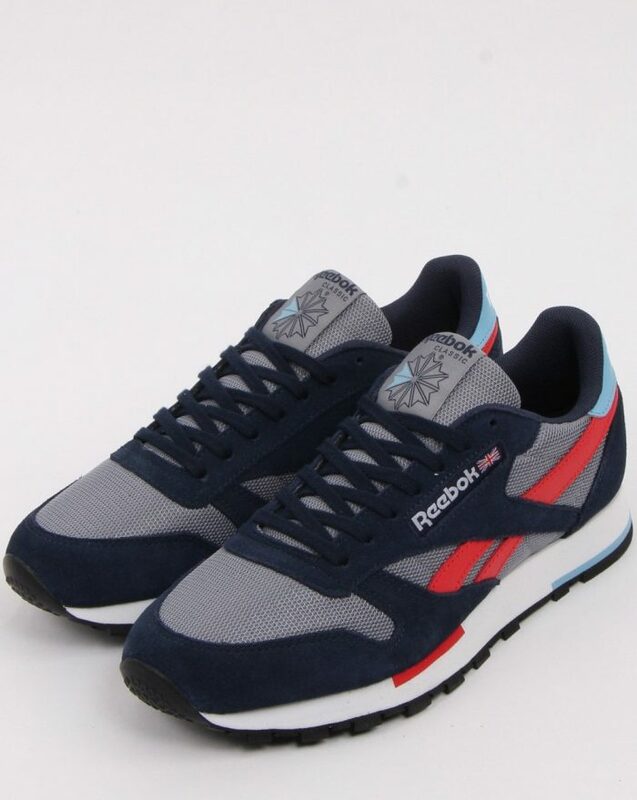 Above: The Reebok Classic trainer in grey/navy now available at 80s Casual Classics. 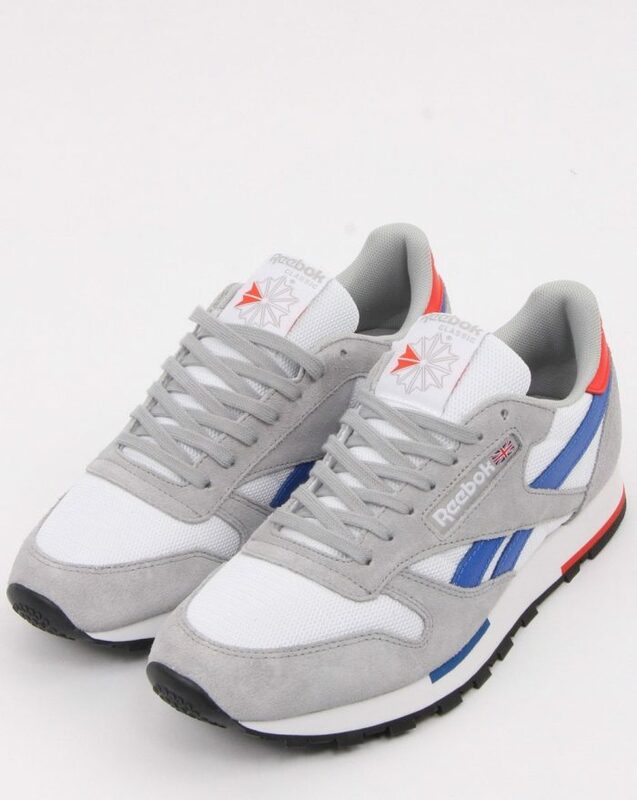 Above: The Reebok Classic trainer in white/grey/blue now available at 80s Casual Classics.